Let us take care of your loved ones the way they should be cared for! 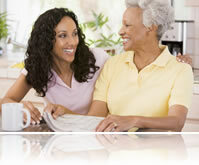 Sultan Adult Day Health Care believes in the importance of health and wellness in one's life. From brain processing as a thinking tool to actions of the body that realize human thoughts by doing things, the capacity of an individual to make these processes possible is dependent on his or her health condition. Sultan Adult Day Health Care is proud to bring you the best healthcare facility that focuses on the health and wellness of our participants. We promote optimal health and mental well being for our participants. We comply with their physician orders, treatment plans and offer support for the caregiver, in a compassionate, enjoyable setting with activities and programs for productivity, self-worth, and socialization which are essential in building self-esteem. Sultan Adult Day Health Care is more than a day care center. We take great pride in making your loved ones as healthy and as fit as they could be as we forward their welfare with dedicated and excellent care and attention. Who is eligible for Sultan Adult Day Healthcare Center: click here to view more.